Buying less expensive computer components and durable household goods over the internet is common. So why not flowers? The addressee can easily be on the other side of the world and will receive a fresh bouquet. 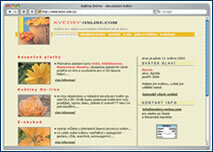 Perhaps surprisingly, there are nearly a hundred online florists in this country offering a wide range of floral wares. In a virtual shop like this you enter your email address and the address you want the flowers delivered to, you pay with a card like Visa, Master Card, or Maestro, and the firm takes care of the rest. From the introductory page, which also contains a calendar with individual name days, you’ll soon be at http://eshop.kvetiny-online.com/. It has 79 pictures of bouquets that you can enlarge with a click to get a better look at them. 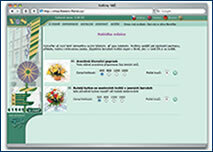 Each has a text listing the flowers that are included and the price, including VAT. All that’s missing from the amount of information available online is the fragrance. This Brno site has also been in operation since 1991, making bouquets to order and delivering them anywhere in the world. There is a network of 200 cooperating florists in various parts of this country, while fellow members of Fleurop and Interflora take care of foreign deliveries. With their help the bouquet will reach its destination, even internationally, within 24 hours. Delivery is within six hours in this country, with a delivery charge of CZK 300. The site also lists the lowest prices for flower deliveries to individual countries and whose name day the delivery falls on. 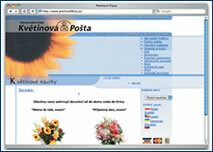 A simple site that serves mainly residents of Prague and its vicinity. Flowers are delivered by EPS courier service within three hours of the order. You can add a message of your own to the fragrant package. Bouquets can be ordered not only by size and price, but also by colors, dominant flowers, and arrangement, which are given names like “Rosy caress”, “Allure”, or “Summer dream”.. This shop proves that the net truly knows no borders. Headquartered in Poland, the firm delivers flowers mainly to countries with large Polish communities – i.e., the US, Canada, Australia, Germany, France, Great Britain, Austria, the Czech Republic, and Ukraine. You can pay with a credit card, and firms that need tax documents can print out their orders from the main page and place them by fax or transfer the funds to the firm’s eBanka account. Premiumflora offers a point-based loyalty program to regular clients and provides advice on taking care of the flowers and arrangements it sells. 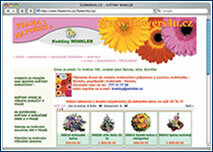 With a well-laid out and easily navigable site, the virtual florist of Winkler in Prague offers most of its services in the Prague region. Let yourself be inspired by colorful pictures of bouquets, or click on children’s birthdays, Valentine’s, Christmas, or funeral bouquets and wreaths for nice visuals and descriptions. Without any additional fee you can order small gifts to go with the bouquet, like a couple of teddy bears, festive balloons, Belgian pralines, or a bottle of wine. Most flowers and gifts can also be delivered throughout the country and abroad. If you want to discuss the details of an order with a live assistant, call the toll-free line on 800 117 755. – Do you have a DVD recorder, but don’t think it’s acceptable that although your new device is intended primarily for recording, it refuses to record films on DVDs? The explanation for this is simple: every DVD title is protected against pirate copying by invisible electronic impulses called macrovision. These impulses so confuse the laser mechanism that the disk is rejected. The recording is accompanied by such a great noise, gaps, or picture vibration and color loss that it seems unusable. Software on some recorders turn off this protection, and another way is to buy a special filter that modifies the signal. However, you won’t get the surround sound, without which watching a home movie theater loses half its spatial benefits.